Diane Waltzing, age 72 of Osakis passed into her new life with the Lord on Monday, February 11, 2019 from the Galeon in Osakis, MN after a brave battle with cancer. Diane Mary Messer was born on July 5, 1946 in Alexandria, MN to Clemens and Isabelle (Bollig) Messer. She graduated from Osakis High School with the Class of 1964. She furthered her education at Alexandria Technical College and on June 6, 1966 was united in marriage to Albert H. Waltzing. They lived in Kimball for a time before moving in 1973 to a family farm south of Osakis where they dairy and crop farmed for many years. Diane was hired as a secretary in 1989, which was a role she enjoyed for many years. She also volunteered for many of those years teaching Religious Education. After her children were grown, she also volunteered at St. Agnes School as a foster grandmother. She was a member of the Immaculate Conception Church in Osakis and belonged to the Daughters of Isabella and the Christian Mothers. Her dedication to her church and its parochial school were a beautiful example of how she was the hands of Christ for others. After Al’s death in 2014, Diane moved off the farm and into town (Osakis), where she lived with her special four-pawed companion, Ruby. Diane had many talents, but was especially good at spoiling her grandchildren. She liked knitting, crocheting and embroidery work and made many beautiful projects through the years. She enjoyed socializing with her many friends and neighbors. As her health faltered and her mobility became difficult, she worked on puzzles and played computer games. 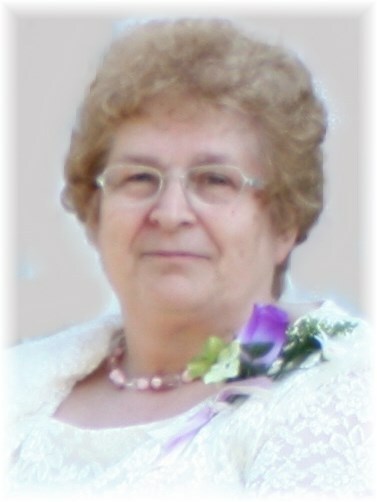 Diane was a caring and hard-working mother, grandma and sister who will be dearly missed and lovingly remembered. Diane will live on in the hearts of her family, especially her children, Jeff (Kathy) Waltzing of Crystal, Lori (Mike) Mielitz of Osakis, Shari (Scott) Chouanard of St. Michael, Kurt (Diana) Waltzing of Osakis, Kristi (Greg) Evers of Sartell, Tami (Tyler) Olson of St. Michael; Randy (Adriana Post) Waltzing of Osakis, 18 grandchildren; 3 great grandchildren; a sister, Doris (Jim) Ratka of Foley; nieces and nephews. She is preceded in death by her parents, her husband, Albert Waltzing (2014), a daughter, Coni Waltzing and an infant son, Robert Waltzing. A Mass of Resurrection for Diane will be held on Saturday, February 16, 2019 at 11:00 am at St. Alexius Catholic Church in West Union, MN with Fr. Greg Paffel officiating. Visitation begins at 4:30 pm on Friday evening at the Roy-Hetland Funeral Home in Osakis with a Christian Mothers rosary and the parish prayers will be said at 7:30 pm. A gathering time will begin on Saturday at St. Alexius at 10 am. Interment is at the St. Alexius Cemetery with honorary pall bearers being her grandchildren and great grandchildren. Active bearers are Greg and Eric Marthaler, Tom Miller, Irvin and Ken Frie and Garhardt Hendricks.